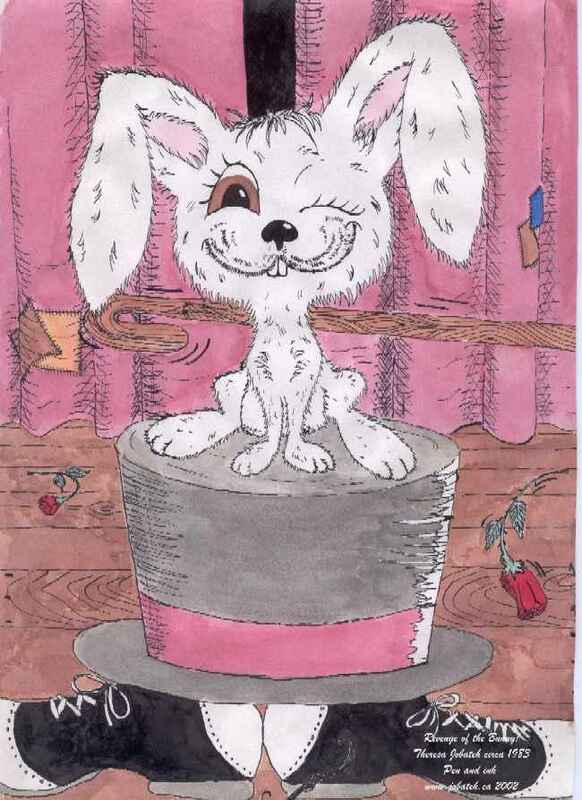 "A lot of people experience the world with the same incredulity as when a magician suddenly pulls a rabbit out of a hat which has just been shown to them empty. "Actually, we are the white rabbit being pulled out of the hat. The only difference between us and the white rabbit is that the rabbit does not realize it is taking part in a magic trick. Unlike us. We feel we are part of something mysterious and we would like to know how it all works." This novel is an excellent example of the story within the story, eventually leaving the reader slightly confused but pondering the interpretations of the subject about which Gaarder is writing: our existence (and how us who-mins have tried figuring it out). To me, this book is an excellent novel and lesson in Philosophy. I plan to read it again and again over the years as well as pass it down to my children. 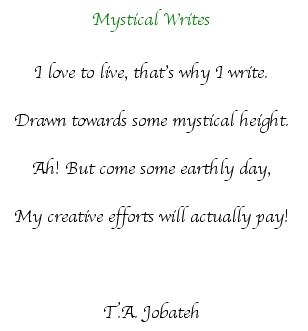 As Jostein Gaarder states in the news clipping below, it's not just for kids; it's for people of all ages. I read this book in 1997 (see clipping below) and was wowed. I read it again in 2002. After reading it again and checking out other's reviews, I noticed that Gaarder covers more of the western thinking and left out Eastern Philosophy. If I understand correctly, Gaarder is bending more towards a claim that there is no such thing as coincidence. Things happen for a reason, by divine intervention of sorts. Near the end of the book, the characters have the ability to change the course of events. Trippy stuff - especially the story within the story technique. If you want to read books that cover "coincidences" and how we can use them to change the course of events, you'll like James Redfield's "The Celestine Prophecies" and the subsequent books in his trilogy. They also challenge us to think about our interconnectivity with the world, with nature and how current thinking and lifestyles are bringing humanity to despair and destruction. 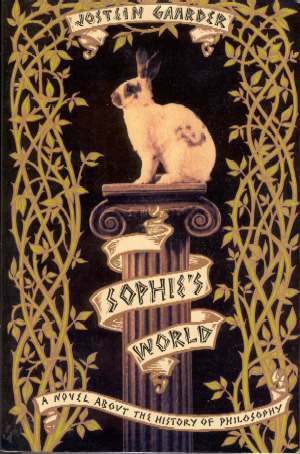 Sadly, I cannot locate my copy of "Sophie's World". I think I had pushed it upon one of my sons but it got buried somewhere. He did though read and do a book review for "The Solitaire Mystery". Now THAT was a good book for young people in understanding a bit about philosophy, family and fate. It also used the trippy story within a story technique. Being easily taken by colourful things, my daughter and I especially loved the parts with the bubbly rainbow soda and colourful fish. Now that they are into their teen years, my children are drawn more to action-packed and visually stimulating renditions of philosophical studies like "The Matrix". There was also a rabbit in this story. Hey! Send me a comment. I'd like to hear what YOU think of the book. Keep on asking questions and don't lose that sense of wonder! 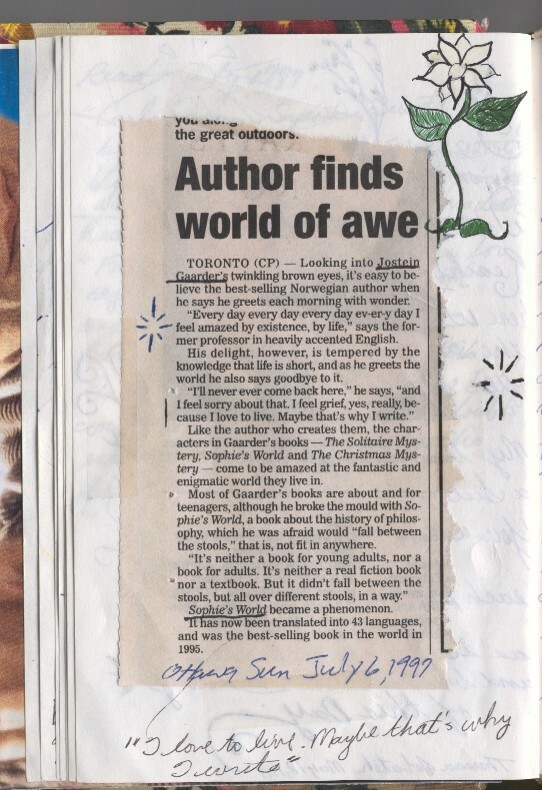 This appeared in a local newspaper shortly after I started reading the book... A lovely coincidence although, from what I understand, Gaarder did not believe in coincidences but more in fate as decided by a higher order.